Fox News host and Daily Caller editor Tucker Carlson championed an Arizona measure that would allow businesses and individuals refuse services to gay people on religious grounds as a bulwark against "fascism." CARLSON: Well it's pretty simple. I mean, if you want to have a gay wedding, fine, go ahead. If I don't want to bake you a cake for your gay wedding, that's okay too. Or should be. That's called tolerance. But when you try and force me to bake a cake for your gay wedding and threaten me with prison if I don't, that's called fascism. Carlson's attempts to distinguish between refusing to provide services related to a gay wedding and refusing to serve gay people in general ignore the substance of the bill. New York University constitutional law professor Kenji Yoshino has noted that the measure is broadly written enough that it would allow any individual or business owner to refuse services to any gay person as long as he or she contended that providing services would burden his or her religious beliefs. Carlson's Fox colleague Megyn Kelly seized on the "potentially dangerous" implications of the bill, pointing out that it could allow a doctor to refuse medical treatment to a gay person. Despite recent criticism of the Arizona measure from some Fox personalities, the network played a major role in encouraging such legislation by waging a concerted campaign to depict marriage equality as a threat to religious liberty. 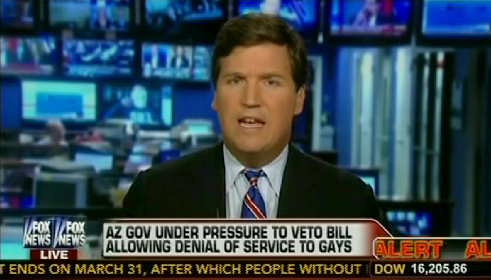 Megyn Kelly: Arizona's Anti-Gay Law Is "Potentially Dangerous"